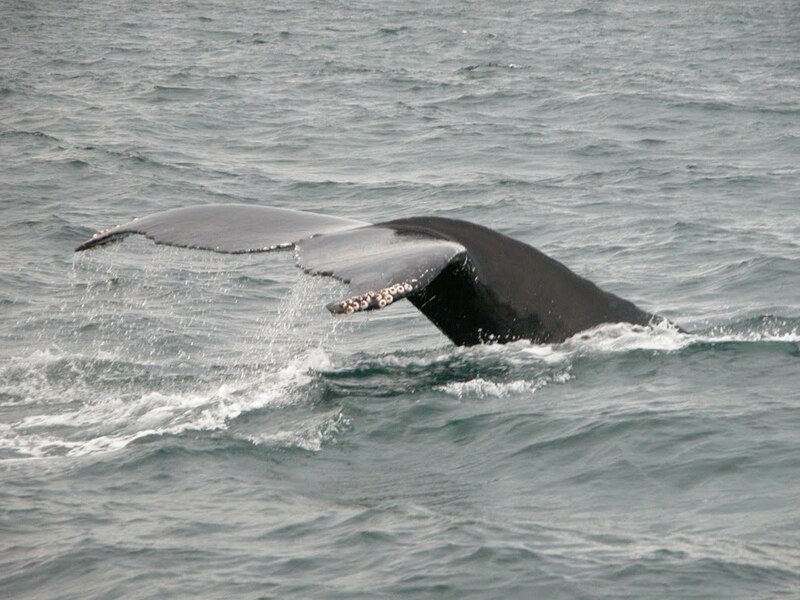 Humpback whales are regular visitors to Ireland’s south and east coasts. These magnificent whales begin to appear around early September each year, and spend several months in the area before moving on to their winter breeding grounds. They are also occasionally sighted elsewhere around the Irish coast. Adult humpbacks are large, thick-set whales that typically measure from 12 – 16 metres (40 – 52 feet) long and weigh around 30 tonnes. Coloration is dark grey to black above with irregular white pattern on the throat and belly. There are 12 – 36 throat grooves that extend down to at least their navel. The underside of the humpback’s broad tail flukes and both sides of its long pectoral fins (which can be up to a third of the animal’s body length) also exhibit a varied white pattern, and the unique nature of these markings can be used like fingerprints to identify individual animals. The small dorsal fin is situated towards the rear of the animal’s body and sits just behind a pronounced hump. Humpbacks get their name from their habit of arching their back before diving, an action that serves to accentuate the hump. They tend to stay submerged for 3 to 8 minutes at a time, but occasionally dive for 15 minutes or more. They have a broad, bushy blow that is up to 3 metres (10 feet) high, and normally blow 4-10 times at 20-30 second intervals between dives. Before a deep dive the humpback will raise its tail flukes completely out of the water. Humpbacks belong to a group of cetaceans known as baleen whales – a description that refers to the specialised feeding apparatus used to strain their prey out of the water. In humpbacks the baleen consists of 270-400 bony plates on each side of the mouth. Each plate interlocks with its neighbour by means of a fringe of bristles forming a sieve when the jaws are closed, effectively trapping small prey inside the mouth cavity where it is then swallowed. In Irish waters these whales feed on small shoaling fish like herring, capelin, mackerel and sand eels. In order to maximise the efficiency of their feeding the whales use a range of techniques to drive their prey into a tightly concentrated group. One of the most interesting methods is called bubble netting. One or more whales circle beneath the prey blowing a steady stream of bubbles. The rising curtain of air traps the prey, forcing it into an ever more concentrated shoal through which the whales can lunge at will. Humpback whales are widely distributed throughout the world’s oceans and migrate between their tropical and sub-tropical breeding grounds as far as the polar ice in both hemispheres. The north-eastern Atlantic humpbacks over-winter off the coast of West Africa and the Cape Verde islands and it is likely that the animals that visit West Cork belong to this population. Among the most vocal of the great whales humpbacks produce a wide range of complex sounds, including the famous “whale song”. Only males sing, and it is thought to play a role in the breeding process. Females give birth to a single calf every two to three years. Calves are about 5 metres (16 foot) long at birth and weigh 1.3 tonnes. 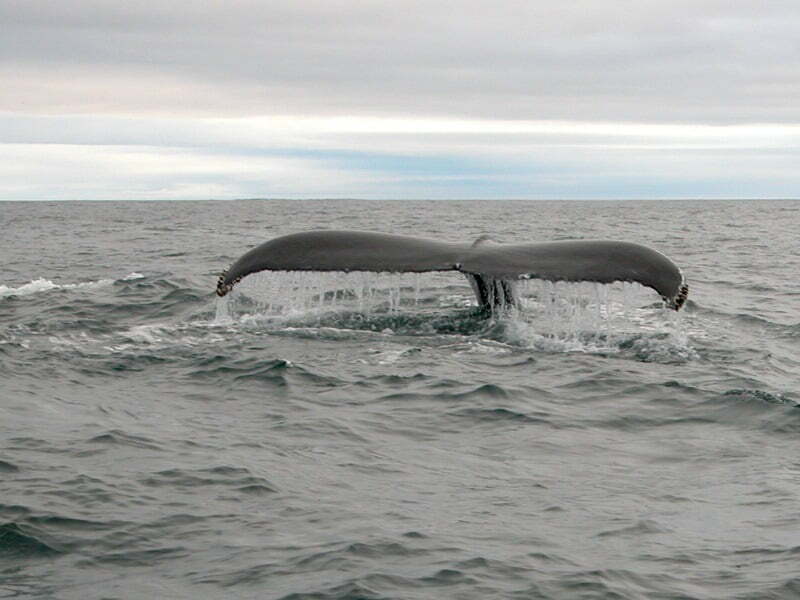 Commercially overexploited from the 1800’s until 1966 humpbacks are still considered endangered in the North Atlantic. If you’d like to learn more about humpback whales and other cetaceans in Ireland visit the Irish Whale and Dolphin Group’s website.